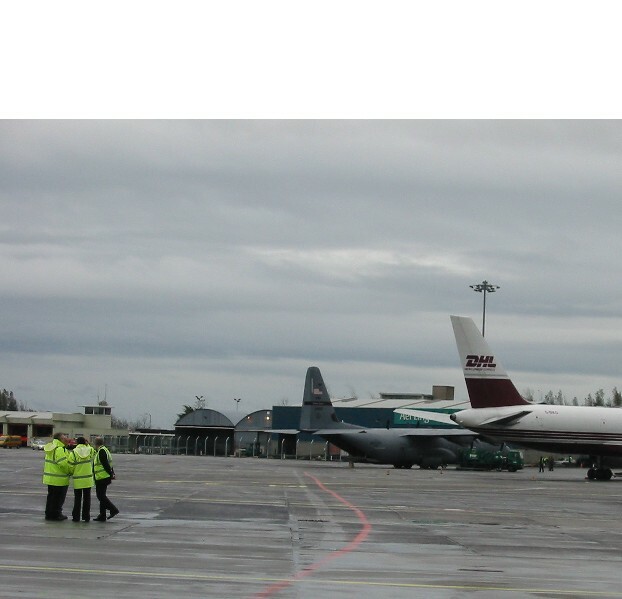 Gardai last night arrested Conor Cregan and retired army commandant Edward Horgan while they were observing suspected CIA jet N478GS at Shannon Airport. This aircraft is listed in the European Parliament’s TDIP report as allegedly being involved in the CIA "extraordinary renditions" programme, under which civilians suspected of terrorism have been abducted and transported to destinations outside the United States, where they have been tortured. Cregan and Horgan, who have been observing and reporting on suspicious aircraft landing at Shannon for five years, were in the public observation tower at the airport, acting on a tip-off. When the aircraft landed at 1.30 am, the two human rights activists called the Gardai to ask them to search the aircraft for victims of the CIA torture programme. But instead of searching the aircraft, the Gardaí asked the two law-abiding activists to leave. When they persisted in attempting to identify and observe the aircraft, they were arrested at approximately 1.40 am under the Air Traffic and Navigation Act, section 33.1. This incident follows a familiar pattern in which the Gardaí at Shannon refuse to investigate aircraft that are known to have been chartered by the CIA and whose flight logs suggest that they have been used to transport abducted prisoners for purposes of torture. Most recently, Cregan and Horgan sighted CIA jet N475LC at the airport on 30 October. They immediately asked Gardai to investigate, but the Gardaí refused. Michael D. Higgins, TD, raised the issue in the Dáil yesterday and received the usual denial by the government. See no evil, hear no evil, speak no evil. Phone Mark Price for further details: 086 3454332. I am in UK at present attending the Stop the War conference in London so am not in a position to make a detailed report, which will follow later. Conor and I were wrongfully arrested, possibly in an atempt to prevent us from positively identifying the CIA plane, fortunatley, as the arrest was taking place the aricraft N478GS was taxiiing past us and we were able to confirm its tail registration number. Coincidentially, earlier that evening in the Dail Deputy Michael D Higgins raised the issue of the previous plane N475LC refuelled at Shannon on 30 Oct 07, and which the Gardai also refused to search, and during which incident Garda Karen Fitzgerald informed me that they were not searching such planes because of an instruction from the Attorney General. During the Dail debate the Government spokesperson Pat Carey TD stated categorically that no such instruction exists. This is likely to be a play on words. I have since been informed by a senior Garda source that a specific letter of some kind, which he referred to as a Letter of Advice from the Attorney General to the Garda Commisioner did exist, and that as a result of this letter or advice the Gardai were not searching the aircraft owned or controlled, or operated on behalf of the CIA. During our attest and detention at Shannon Garda Station I handed the arresting officer a full copy of the 77 page report by the EU Parliament TDIP committee into the CIA rendition issue, in which both planes, N475LC and N478GS were cited as having been involved to a significant degree in the rendering of prisoners for torture. I also handed him a printed photo of the Gulfstream IV N478GS which I informed him had been taken in the US about 8 hours previously as it was about to leave for Shannon, and I also handed him a copy of a report printed in the Chicago Tribune in 2006, concerning the rendition activities of N478GS, particulalry the crash in Romania in which the plane was substantially damaged. The primary issues here are not about the arrest of Horgan and Cregan. The issue is that the US government and its agents are torturing prisoners in Guantanamo, and other secret location on the instructions of President George W Bush. Because of constraints on the degree to which they are allowed to torture these prisioners in Guantanamo, a significant number of these prisoners have been sent from Guantanamo to other so-called Black Hole prisons, particulalry in Egypt, Morrocco, Jordan, Pakistan, Afghanistan and other countries ruled by dictatorial regimes. Several hundred of such prisoners are now "missing", in that there whereabouts is not known to either the Red Cross or the Red Crescent as is obligatory under unternational law. It is tknown that some of these prisoners have died under torture, and it is most likely also that many others will be permanently disappeared or executed when they are no longer of use to the US and its allies. The reason for this is to prevent the facts of their torture becomming public knowledge, and to prevent large claims for compensation from the victims and their families. I was at Shannon airport again less than 10 hours after my arrest on my way to London. While I was there, there was one Hercules C130 on the ground and two others landed. All three were fuelled while I was at the airport and I saw all three subsequently take off. 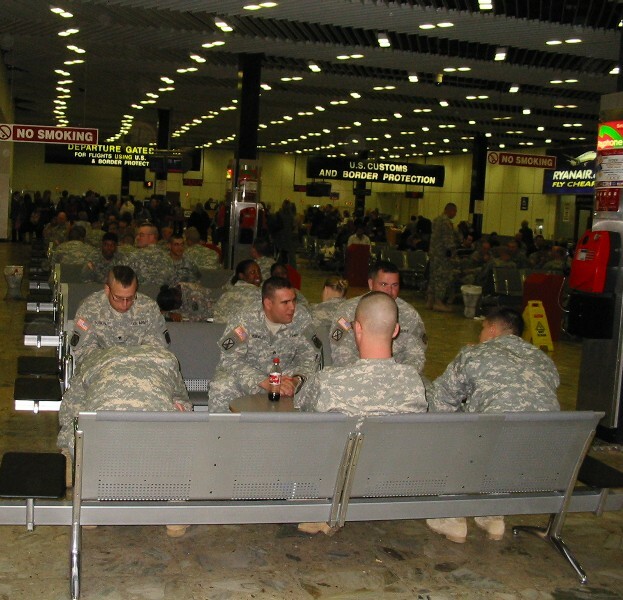 The airport departure lounge was also full of US troops. I got talking to serveral of them, watched closely ty Airport Security. I also took several photos of them which I will publish here later. I wished them a safe tour of duty in Iraq, but pointed out that they were going to an unlawful war, and that they were in breach of international law by being on Irish territory. They informed me that they were going to Iraq for a 15 month tour of duty, mainly in B aghdad, One said he was from a "chemical" unit, and we joked that he was unlikely to find any chemical weapons in Iraq. They troops were mainly from a "Mountain Brigade". 10 hours earlier Conor and I had observed another planeload of troops going back to the plane through the glass corridoor. The were obviously returning to the US and at least one of them appeared to have consumed a large amount of alcohol or was suffering from extreme fatigue, because he was literally staggering. These troops are also victims of an unjust war, but in addition to being victims, they are also perpetrators. Conor and I intend to ensure that the issue of US torture rendition planes at Shannon will not be brushed under any carpet. This issue involves the Irish Government and the Gardai being knowing complicit in gross breaches of human rights, including torture and murder. While I am firmly convinced that several prisioners have been transported through Shannon airport for torture, it is not necessary to prove this to show that the Irish government is in gross breach of the UN Convention on Torture. 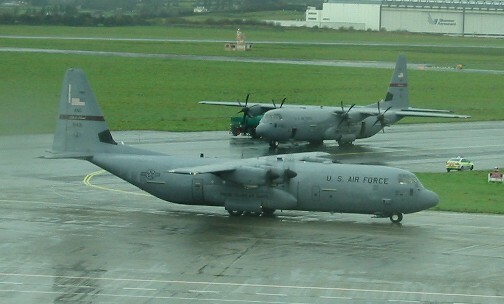 Just as it is an offence to provide a car to take bankrobbers to a bank robbery, and to provide a getaway car, it is likewise a much more serious offence to provide refueling facilities and territorial transit facilities for torture planes, their crews and torture teams, at Shannon airport. The fact that the most serious acts of torture are committed outside the Irish jurisdiction is also not relevant. In the case of the Omagh bombing in Northern Ireland, Irish citizens have been prosecuted by the Gardai on the instructions of the Attorney General, for providing Cars and other facilities including mobile phones for the Omagh bombers. The Irish Government is playing the same role for the US torturers. N368CE (previously 9M-CHG), registered to Vision Air, a Nevada corporation with bases in Vegas and Baghdad (! ), who "operate contracted flights, mainly for the US government" and have 4 737s and 5 Do328 JET small executive jets (maybe someone should tell Comm Horgan). Very deeply buried data. Edit: http://www.aerotransport.org search on Vision Air." Please disregard my comment above. The plane I'm referring to is not the plane observed by Ed and Conor lastnight. Old age coupled with stupidity aint pretty. This plane crashed in Romania a few years ago blowing the lid on the "Black Prison" sites in Europe. Click on the link for details. The Garda Sergeant who arrested us said he will be charging us so we can look forward to some fun and games in court. Of course you are all invited. "The primary issues here are not about the arrest of Horgan and Cregan. The issue is that the US government and its agents are torturing prisoners in Guantanamo, and other secret location on the instructions of President George W Bush." The primary issue for me is that the Republic of Ireland is a SOVERIGN state, which should not (in my view) be in any way involved - EVER - with the unlawful invasions of other soverign states. If there is a court case (in connection with the recent arrests), I hope the issue outlined in the paragraph just above will be raised, and that the CONSTITUTIONALITY of the whole overall situation will be checked (and clearly decided on): once and for all. I believe we have here yet another example of our senior "public servants" (so called) breaking the BASIC law of the Republic of Ireland (i.e. Bunreacht na hEireann) with impunity: and being allowed to get away with it, year after year, after year - and in spite of the "Doctrine of the Tripartite Division of Powers of Government" principle which lays at the heart of Bunreacht na hEireann (as outlined at http://www.europeancourtofhumanrightswilliamfinnerty.co...Daily ). How can you live with yourself Ed Horgan? Total turnout during the December 2005 Iraq elections was 79.6 % or 12,396,631 of Iraqis who voted for 275 representative of whom 25% were women. After six months of negotiations a "government of national unity" was agreed between the United Iraqi Alliance, Iraqi Accord Front, Kurdistani Alliance and Iraqi National List, under the leadership of Prime Minister Nouri al-Maliki. While the violence continues, violence which is orchestrated by Sunni, Shia and jihadists who want to overthrow the Iraqi government and replace it with Islamic dictatorship, democracy has taken root permanently in Iraq. This would not have had a ghost of a chance under the regime of Saddam Hussein which is thankfully no longer with us. Whatever future either for ill or for good will now be decided by the Iraqi people alone. The US will remain until Iraqis can take full control of the country which they essentially do already except for a a few remaing provences. The majority of Sunni sheikhs and the Shia mullahs who were opposed to the democratic reforms have recognised that they have been defeated militarily by the US which shows no sign of cutting and running and negotiations wil last for many years before finally it can be decide whether Iraq will remain in one piece as a federal republic or split into a Kurdish, Sunni or Shia state under a loose umbrella. The anti-war movement would have us believe that Iraq unified under Saddam Hussein has the support of the Iraqi people prior to 2003 that because it was secular that somehow its brutality was more tolerable and that the lack of WMD or UN authorisation for the 2003 invasion makes every development since illegitimate even though millions of Iraqis now have a chance to have democracy. The leftist progressive movement has been shown to be a sham for its oppostion to the overthrow of a dictator, its oppostion to democratic reform in Iraq and its opposition to fighting the enemies of the democratic system in Iraq. The leftist progressive movement does not care. It is obssessively Anti-American so no matter whether it is Bush presently or in the future Clinton or Obama who will preside over the irreversible process in Iraq they will be shrill in their condemnation. "Whatever future either for ill or for good will now be decided by the Iraqi people alone." "It is obssessively Anti-American so no matter whether it is Bush presently or in the future Clinton or Obama who will preside over the irreversible process in Iraq they will be shrill in their condemnation." I think I see a small contradiction. "While I am firmly convinced that several prisioners have been transported through Shannon airport for torture"
On what basis are you CONVINCED? Hard evidence, soft evidence, insider tipoff, rumour, pub talk or just gut instinct? Would be intrigued to hear details. "it is not necessary to prove this to show that the Irish government is in gross breach of the UN Convention on Torture"
"Just as it is an offence to provide a car to take bankrobbers to a bank robbery, and to provide a getaway car, it is likewise a much more serious offence to provide refueling facilities and territorial transit facilities for torture planes, their crews and torture teams"
Again if by "torture plane" you mean a plane that is in the act of transporting a prisoner for torture, that's also true. But you appear to use the phrase rather loosely to mean any plane that at any time, ever, had an involvement in a rendition mission. There is no requirement under the convention to deny facilities to aircraft on the basis that they PREVIOUSLY were involved in "rendition" flights. Especially if there is no reason (ie evidence) to believe their current mission involves transport for torture. To labour your bank robbery analogy a bit, it would not be a crime to supply fuel to a car that a bank robber owned and once used as a getaway car. Not a very good analogy perhaps but its the one you used. Whilst it's not for me to provide the evidence that proves kidnap victims bound for some hellhole site to be tortured, travelled through Ireland, I'd like to tackle some of the points made above. The planes are only a key and to focus on them exclusively means never unlocking that which is being kept hidden. Of course not to use the key on the other hand means never unlocking the crime. i. The US via the supreme court and via legislation have given themselves the power to violate the sovereign laws of any sovereign nation with regard to rendition and to do so without informing any sovereign government of either its actions or intentions. Because of this fact, accepting assurances from the US government, does not constitute doing one's sovereign duties, when it comes to ensuring that crimes against humanity are not perpetrated on Irish soil. The Irish government are fully aware of all of this. ii. As I said, the planes are only the key. The US government has continued to practice Rendition and still practices it. The Irish government are aware of this too. iii. The Irish government continues to facilitate known criminals, and they know that these criminals are still perpetrating their crimes against humanity and still they choose to facilitate and aid them. Plausible deniability left the building long ago. That leaves us with a criminal act and it's a biggie. Our government are guilty of crimes against humanity. Fair enough, innocent until proven guilty. All that's missing is the court, we already know the government's defence and we know that it doesn't hold water. They can always change it later, but that makes them liars (again). The lies are unlocked by the key no matter what face they choose to wear. And in turn it can be shown that their lies have facilitated crimes against humanity. Voodoo optics; the last refuge of scoundrels? Solidarity with Ed and Conor; two brave men of conscience who, along with Tim Hourigan, confront, illuminate and shame the ongoing criminal collusion of this country with the US in the facilitating of CIA torture planes transiting through Shannon Airport. What does it matter that Ahern and co indulge in voodoo optics and spin; that there is "no hard evidence" that the Airport is being used as a stopover for CIA torture flights when it is deliberately not looked for; a rose by any other name would smell as sweet or in this case stinks?, criminal collusion is criminal collusion, whether it's deliberately fogged-up with propaganda or the contemptible three monkey denial of the government?. It matters greatly, though, that these men of conscience in bearing witness, are harrassed and criminalised, it's happening in Shannon, Rossport and to the Raytheon 9. I for one will be attending the Shannon Peace Camp on Jan 6th. I'd like to remind the Minister of an old Dublin proverb: Denial is not a river in Egypt. There are none so blind as those who will not see. Contrarian, it is misguided patriotism to suggest that a country that itself practises kidnapping and torture all over the world is capable of bringing freedom to any other country. Your federal government has lost track of the fundamental principles of freedom that the American people hold so dear. The CIA itself is being "obsessively anti-American" in pursuing its outsourcing of torture programme, and you yourself are undermining American values by speaking up to defend this torturing regime. Your patriotic analysis seems to reflect wishful thinking, as there is evidence that it is not the Sunni sheikhs or Shia mullahs but the US forces in Iraq that are defeated. For example, in Anbar province, the US has been backing Sunni militias. These militias did not fall in behind the US forces, the US forces realised that they had to fall in behind the militias. The thinking seems to be: "If you can't beat them, join them." Meanwhile, British forces have withdrawn from Basra, because they were defeated by the Shia militias. Saddam laid this trap by training and equipping militias around the country, and the occupation forces are squirming in this trap. As somebody who loves America, I find it painful to watch. Nobody who loves America wants to see your most courageous young men and women being killed in a country where they are not welcome. But your federal government seems to be following the motto: "We will accept nothing less than total defeat." You say that "millions of Iraqis now have a chance to have democracy," and that's a very noble aspiration, but what about the hundreds of thousands of innocent Iraqis who have been killed by "shake and bake" bombings with US weapons of mass destruction in Fallujah, exposure and heat stroke caused by destruction of houses and shortages of electricity, diarrhoeal diseases spread by dirty water, starvation caused by destruction of crops and transport infrastructure, and all the other miseries that the invasion and occupation have brought? These hundreds of thousands of Iraqi civilians will never get a change to participate in an Iraqi democracy, for the simple reason that they are dead. 10 hours after my arrest at Shannon I travelled through the Airport on my way to the Stop the War Conference in London, attended by about 1,000 people. The following pictures were taken by me as I made my way through the airport. It seemed that a "surge" of some sort of US Troops was passing through, but such numbers of troops and US military planes are no longer unusual. I spoke to several of the troops and was told that they were on their way to Iraq, for a 15 month tour of duty, which is now the normal (initially the US tours of duty in Iraq were about 6 months). Two of them told me they had about 6 years service but intended leaving the army after this tour, because they were disillusioned. One said his mother was strongly opposed to the Iraq war, and to Bush. When I arrived at the airport two US air force Hercules C 130 were already being refuelled, and one more landed half an hour later. All three took off within the hour. 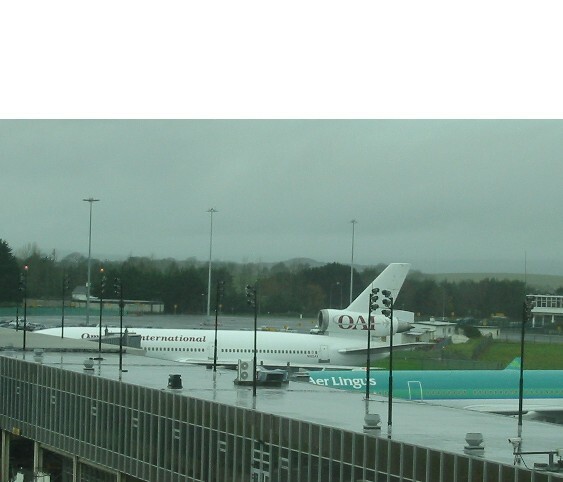 Also parked at Gate 42 was an OMNI air Chartered US troop-carrier. 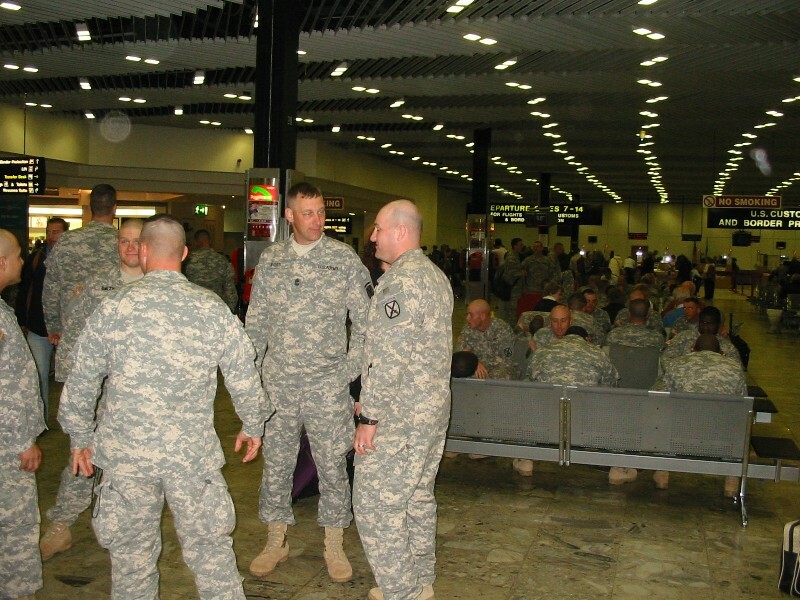 As I went through the duty free area and departure lounge I met the passengers of this troop-carrier - about 2000 US troops dressed in their desert combat uniforms. I wished those I spoke to a safe tour of duty, but informed several of them that they were in breach of international law by transiting through a neutral state on their way to a military operation such as the occupation of Iraq. While there were no CIA planes that I know of present at mid-day on 30 Nov 07, clearly there had been one just 10 hours earlier, and there was no way of knowing whether one of the Hercules C130s may have been carrying prisoners to some destination where varying degrees of torture are perpetrated. I want emphaise again, these events are not about Conor and I, we are simply the means of exposing what is going on, even if at considerable costs to ourselves at times. The issues involved here are gross abuses of human rights, including torture, murder, assassinations, and waging of unlawful wars. Jose Padilla will be sentenced this coming Wednesday. Padilla an American citizen was convicted during the Summer on a number of charges related to being a member of Al Qaeda. The prosecution are calling for a life sentence in a maximum security prison, despite the fact that no evidence was offered in the trial that showed that Padilla had harmed anyone or that the had conspired to do so. What hope can there be for a kidnap victim in Guantanamo or some secret prison with regard to torture, when this can happen on American soil: "But there is one major area of Padilla's life that federal prosecutors say Judge Cooke must avoid. For three years and eight months, Padilla, a US citizen, was held without charge in a military brig as an enemy combatant on the orders of President Bush. He was housed in an isolation cell and subject to harsh interrogation techniques that Padilla and his lawyers characterize as torture. The experience, from 2002 to 2006, has left Padilla with severe mental disabilities from which he may never recover, according to mental-health experts who have examined him. " Government officials say: "Padilla's treatment and detention by the military as an enemy combatant involve classified information that cannot be disclosed in open court, according to government officials." Here's what's coming out about CIA victims brought to jordan: "Former prisoners have reported that their captors were expert in two practices in particular: falaqa, or beating suspects on the soles of their feet with a truncheon and then, often, forcing them to walk barefoot and bloodied across a salt-covered floor; and farruj, or the "grilled chicken," in which prisoners are handcuffed behind their legs, hung upside down by a rod placed behind their knees, and beaten." Higgins via Horgan Garda Fitzgerald said to Mr. Horgan that they had instructions from the Attorney General not to inspect such planes. Deputy Pat Carey: Information Zoom However, the Minister wishes to strongly contest any claim or suggestion that this occurred because of an “instruction” that searches in general or searches of particular types or classes of aircraft should not occur. Deputy Pat Carey: I Moreover, that a particular aircraft is rumoured to have been associated with the CIA on, for example, certain Internet blogs does not constitute probable cause to ground an inspection. Deputy Michael D. Higgins: It is on the European aircraft register of flights. Contrarian if the bank robbers car had not been searched at the time of robbery and you had suspicion the robberies were continuing (unlikely) it would be right to search it first opportunity and every other time aswell. • Aircraft N478GS and N475LC belong to the company Centurion Aviation Services. • This company is relevant, within the framework of CIA flights, as a beneficiary of the so-called "landing permits" in the US military bases all over the world. The Civil Aircraft Landing Permit (CALP) authorizes aircraft to land on US military bases worldwide. These companies are generally private. In the past (until year 2005) such landing permits were attributed to companies notoriously linked to CIA such as Devon Holding Inc; Premier Executive Transport Services; Rapid Air Trans; Richmor Aviation, Inc; Stevens Express and Tepper Aviation. Currently 10 companies hold such certificates.72 The last CALP granted to the company Centurion Aviation Services expired on 1 October 2006. • According to flight logs, both aircraft (N478GS + N475LC) made the most frequent stopovers in Shannon airport, Ireland (76 stopovers in total). Other European airports constantly visited are: UK, Greece, Turkey and Romania. As regards non-European airports, the most used ones are: Kuwait, Egypt, Qatar, Israel, Georgia and Bahrain. • As proved by official information received from the Romanian Government, on 6 December 2004, the aircraft registered N478GS, coming from Bagram (Afghanistan) had an accident when landing in Bucharest and destroyed its wheels and its tank. On board there were seven American passengers who disappeared quickly after the accident. One of them was carrying a gun. 3. In some cases we have evidence that some of these aircraft were used for proven "extraordinary renditions" (Abu Omar, Maher Arar, Khaled el-Masri, Ahmed al-Giza and Mohamed al-Zari, Binyam Mohammed, Bisher Al Rawi and Jamil El Banna, Abu Al Kassem Britel), given that aircraft on our list were used in each case. 5. It should be noted that in many of the countries referred to, torture and imprisonment without trial are common. Manfred Nowak, UN Special Rapporteur on Torture, stressed in his last report to the General Assembly that some countries, including the United States, the United Kingdom, France and Sweden, had violated international human rights conventions by deporting suspected terrorists to countries such as Egypt, Syria, Algeria and Uzbekistan, where there was a high risk of them being tortured. Within the context of the "extraordinary renditions", the CIA has often used private companies and charter services for aircraft rentals. Through civil flights it is possible to reach places where military aircraft would be considered suspicious. Furthermore, thanks to civil flights, the CIA avoids the duty to provide the information required by States concerning government or military flights, according to the Chicago Convention. Most of these companies are the so-called "shell companies": they only exist on paper (post offices boxes, for instance) or they have a sole employee (normally a lawyer). These shell companies appear as the owners of aircraft which are systematically the subject of buy-and-sell operations. After each transaction, aircraft are re-registered in order to lose their tracks. Born out of the frustration with the lack of real choice among the existing political parties. Democratic Reform is a vision of how the Irish Nation might be. The promise of an independent, democratic, inclusive Nation, has largly been unfullfilled, since the foundation of the Irish Republic. This is partly due to the divisions which emerged, at the foundation of the State, and the civil war which ensued. Fianna Fail, Fine Gael, and the Labour Party, all come from the same beginning, but chose different roads to achieve Independence. The successors to the great men and women who founded the Irish Republic, appear to have lost faith in the ability of the Irish People to stand alone as an independent Nation. Sorry, Frank, but 'to stand alone as an independent nation' defies the reality of the growing interdependence of the global human system. If we are to take our place among the nations we will have to start from the premise that the earth is spherical, finite and expendable, and burning away under our overpopulating feet. Nationalism had its place in extracting us from the brittanic empire and providing us with global leverage, but the technology is converging towards a borderless globalisation. The task, from my perspective, for the 21st century is to tame the corporate globalisation that parasites on this evolutionary process. Part of that has to be the reclaiming of our increasingly diverted misrepresentative demockracy, but the war-front is the disinformation and often consquent ignorance that elevates competition over the increasingly necessary co-operation it is going to take to stop us self-destructing for the entertainment of some future species of inter-galactic archaeologist. The blackout on information and arrest of activists engaged in cutting through the fog of the info-wars, from Vanunu in Israel, through Biko in South Africa, Saro-Wiwa in Nigeria and the lads documented on this site, or Pat O'Donell and Niall Hartnett at Shellmullet point to the post-national task at hand. Its probably largely a differing of language, but then thats what happens when the first issue on Paddy's agenda is who owns the movement. Stay free, particularly of simplistic abstractions that dispense with the ever-increasing complexity of the dominant multi-flagged consensus of the nationalist carrots. We can participate, but the problems of modern Ireland cannot be solved from within exclusive Irish coastlines. We must address the false globalisation being pumped by the economic idiots who are resigned to the twenty-first century imperial 'Great Game', just so long as they get to hob-nob with a few of the 'Players' ; while our resources and the rest of us serve as their labour-unit chips. Watch out for the false premises.They are mostly what divide us.More damage is done by well-intentioned misreadings than actual malice.I hope that doesn't come across too negative.